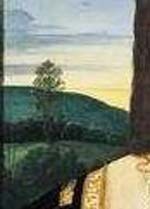 Detail "Madonna in the Meadow"
In Umbria we are truly blessed with magnificent works of art from Renaissance artists. 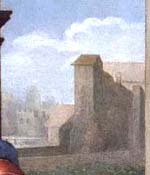 It’s not just that there are so many important pieces from the period scattered around the province or that many of the geniuses were born or trained in the area, but also the fact that many frescoes and paintings are still in the original settings the artist intended for them to be seen. In Umbria you don’t just get to appreciate the paintings but the whole environment. Its ultramarine skies, the billowing clouds and the green rolling landscape that shaped the way the masters thought about their compositions. Burnt umber, raw Siena and Naples yellow; these are not just colours on a pallet in this part of the world but an essential piece of the countryside. 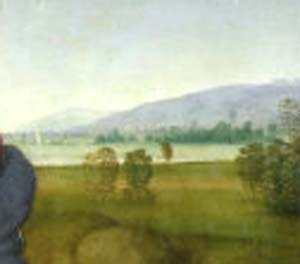 The viewer will get to see the paintings in the countryside where as a boy; just up the road in Perugia, Raphael trained under the expert tutorage of the Master Perugino. Here too Raphael left his mark in the city, with examples where he is seen ably assisting his master, along with important pieces of his own. The Raphael display includes early works under taken in Urbino and Perugia, to his Sienese and Florentine period and culminating in his later years working on Rome. There are also film documentaries detailing the life and work of Raphaello Sanzio giving visitors a truly informative and imaginative interpretation of the artist. The exhibition will run until the 28th of August in the sumptuous surroundings of the 16th century Palazzo del Vignola, Todi. -Citta di Castello, Pinocoteca Comunale Gallery – Religious banner believed to be one of his earliest works, in poor condition now. 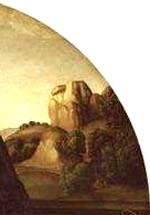 and an elderly Perugino, in one of his last works completed the side panels. 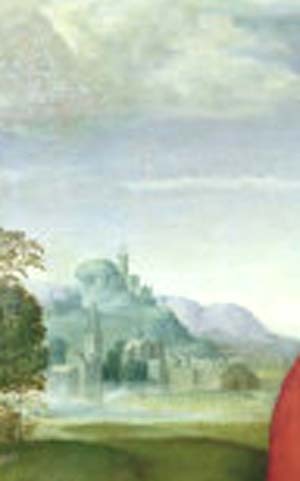 -Perugia, Collegio del Cambio – Perugino fresco, it is believed Raphael assisted him. If you would like to find out more about art trips and painting tours around the Umbrian, Tuscan countryside or the many other memorable days out, please contact Travelling Contentfor more information. This entry was posted in Painting and tagged art, exhibition, painting, sightseeing, Todi, tour. Bookmark the permalink.